Now you can get everything you need to create intricate die cut projects in one beyond amazing bundle! 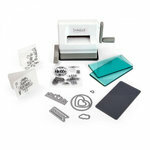 Included is the popular Spellbinders Platinum 6 Machine and the best-selling Tool N One multi-purpose crafting tool. 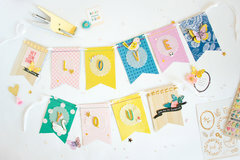 This crafter’s dream bundle will make your crafting projects a cinch! The Tool N One crafting tool features three interchangeable attachments including the roller brush, spatula tool and the paper piercing poker tool. The roller brush is used to roll over your die removing all those intricate pieces that are so hard to remove, the spatula tool is for running along the inside of your die making it easy to remove your die cut without tearing it and the paper piercing poker tool is great for removing those pesky little pieces that just want to stay stuck in the die! We think the best feature that makes this tool handy and portable is that your attachments can be stored inside the body of the tool. And don’t limit the use of this versatile tool to just die cutting, it’s great for hobbyists that work with miniature houses, model airplanes and other small pieces and parts. The Spellbinders Platinum 6 machine is going to impress you with its overall performance and if that isn’t enough, you’re going to love how classy it looks in your crafting space. This white machine has a sleek design and is a full-size die cutting and embossing machine that packs a punch in its compact size with its small footprint. 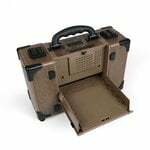 The sides of the machine fold up and the handle can be removed making on-the-go crafting and storage a cinch. This machine works great with paper, cardstock, fabric, felt, balsa wood, foam, foiled paper, vellum, chipboard, cork and more. You will love how easy it is to store and how wonderful it is for creating cards, DIY projects, tags, gift boxes and anything else that you can think of! The Platinum 6 features VersaCut technology that provides strength, durability and power. The solid steel core construction will cut up to six layers in a single pass when using the Contour Steel Rule Dies (sold separately). Clean the machine and its accessories with a slightly damp cloth only. Do not use a cleaning product or chemical cleaners on the machine. Canned air may be used to remove dust and debris from small areas of the machine. If your handle requires lubrication, place a small drop of household dish detergent between the white and bronze parts of the handle and rotate the handle to distribute. Alternately, you can remove and immerse the handle into clean water with dish detergent. To prolong the life of the plates, use both sides and remove any scrap materials after cutting. If the result of die cut is incomplete cuts, add a shim (piece of paper at least as large as your die templates) between the bottom Cutting Plate and your die template to increase the pressure while die cutting. Warranty: The Spellbinders Platinum 6 comes with a limited one year warranty. The machine is warranted to be free of defects in workmanship and materials. Spellbinders will repair or replace a defective product or parts without charge with proof of purchase. If the product is damaged due to misuse or neglect, the warranty is null and void. Register your warranty at SpellbindersCreativeArts.com/warranty. Cutting Copper Sheets and Soda Cans! For years I longed to own a die cut and embossing machine, but held back because of certain limitations or bad reviews from buyers. My main motivations for purchasing the Spellbinder's Platinum 6 from Scrapbook.com. • Smooth and quiet operation. No cracking or popping noises during operation. • Multi-media cutting and embossing capabilities it can process a wide array of materials. • The Platinum's platforms fold up and the handle retracts to form a sleek and compact exterior design–making storage an absolute breeze. • It was on $ale!!! The Platinum 6 Die Cutting machine is simply great because you can use it for different die cutting and embossing needs since it comes with the standard platform, clear cutting plates, an embossing plate and mat! It is also so storage friendly which is just another bonus! I can easily fold the panels to put it in my cabinet. By the way, the first thing I noticed when I used this machine, is that it is quieter than others. When you run a die cut through, you won't hear (scary!) cracking or popping noises so there's no need to fear that your cutting pad will break in two. :) So overall, great machine that I'd recommend to anyone. Bears, Papa, Mama and Just Right! I believe the machines to be superior because they are quieter and smoother to operate. Not as cumbersome as the Sizzix products. I've had quite a few die cutting machines in my time and this is one of the best. It looks great, and because the platforms fold up it takes little space on the desk when not in use. I've had the machine a few months now, but I think I'm still learning the best way to use it for different materials, and which sandwiches to use for best results. Like all things, its worth taking the time to experiment! 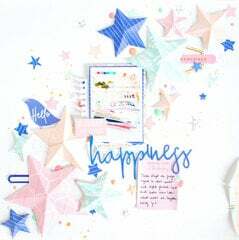 I'm a quite experienced die cutting machine user and should say that I absolutely love this one. First of all and foremost - it does its cutting and embossing job very well (and that's why we buy such products in the first place - to die-cut and emboss). I used it both with water thin and steel-rule dies and never had any problems die cutting them. It works beautifully with very intricate dies as well. The instructions on the cutting platform very clear to understand and follow. I appreciate the fact that embossing mat is included, so I don't need to hunt for it and buy separately. And speaking of embossing - another feature that I love is that there is a separate plate for embossing. So there is almost no guessing game of how to create a sandwich, less chances to use a wrong plate risking to break the machine. The ability to fold it cutting surface is a big plus for me. This machine is very storage friendly. You do need to store plates separately, but I personally do store similar products for die-cutting in a bin, so it wasn't a problem for me. I have used many die cutting machines over the years and this machine tops them all. I love the small foot print and ease of use! I use it actually more than I ever thought I would and not usually for paper crafting which is a testament to this machines versatility! I have cut balsa wood, crafting foam, fabric, and vinyl and have loved the results. I highly recommend this machine! I really love the Platinum 6 for cutting unconventional materials. I'm an artist and make outdoor garden art and wreaths, so they have to last the elements more than paper can. The Platinum 6 cuts through sheets of copper and soda cans, as well as thick wool felted sweaters and fabric. It's essential to my studio. I absolutely love this machine. I've possessed Sizzix Big Kick and Big Plus machines, so I have something to compare with. 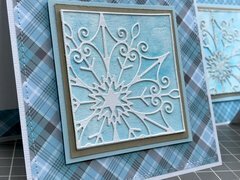 First, I like that the pressure while cutting is slightly more heavy than in Sizzix, it's quite important while you're using the delicate and intricate dies . The Second, the great advantage is that the started set that goes with the machine has the embossing mat and the pad. For instance, Sizzix doesn't have those and you need to buy them separately. Also I like the fact that the sides fold up and it's quite easy for your storage to keep the machine. I bought this machine to die cut intricate dies and emboss with stencils. It does die cut the intricate dies, better then other machine I have, but the paper remains in the die and is difficult to remove. So far I have been unable to emboss using a stencil. Used different sandwiches to no avail. My old machine has a magnetic platform and the Platinum 6 does not. Contacted Spellbinders and there is no magnetic platform available. Is this machine wider than the big shot and is there an advantage to the Platinum over the big shot. By: jbuell13 (09-Apr-19) Helpful Question? Yes | No Thank you! Report Inappropriate This question has been reported. Thank you! The width is the same as Big Shot. This machine cuts very well using spellbinder dies. It is very sturdy and solid and the handle turns very well even with thicker cardstock. It is a great tool to own and take up less storage space than Big shot. By: 1flocraft (10-Apr-19) Helpful Answer? Yes | No Thank you! Report Inappropriate This Answer has been reported. Thank you! Thanks for any help. By: User (13-Feb-19) Helpful Question? Yes | No Thank you! Report Inappropriate This question has been reported. Thank you! The paper goes inside the embossing folder. Do not cut the embossing fold, it is supposed to stay attached. By: VickyLevy (15-Feb-19) Helpful Answer? Yes | No Thank you! Report Inappropriate This Answer has been reported. Thank you! How wide a die can be run through this machine? By: Kunkle (08-Nov-18) Helpful Question? Yes | No Thank you! Report Inappropriate This question has been reported. Thank you! 8 inches By: Paula Story (09-Nov-18) Helpful Answer? Yes | No Thank you! Report Inappropriate This Answer has been reported. Thank you! Can I use Thinlits Dies in my Platinum 6 cutting machine? By: THol (01-Mar-19) Helpful Question? Yes | No Thank you! Report Inappropriate This question has been reported. Thank you! yes, you can. By: Monkeyta (03-Mar-19) Helpful Answer? Yes | No Thank you! Report Inappropriate This Answer has been reported. Thank you! 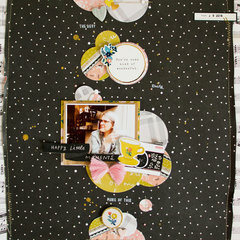 does this work with Tim Holtz dies? By: User (21-Feb-19) Helpful Question? Yes | No Thank you! Report Inappropriate This question has been reported. Thank you! I have not used my Tim Holtz dies in this machine but all that I read before buying this machine said that it was compatible. Sometimes you have to add thin paper, cardstock OR thin cardboard as a shim for die cutting. Hope this helps. By: hunnygramm (23-Feb-19) Helpful Answer? Yes | No Thank you! Report Inappropriate This Answer has been reported. Thank you! I want specific items that match the card I am working on. Is there a big variety of dies and won't that be expensive or should I go with digital. I am all new to any of this. By: calandsue6 (17-Oct-18) Helpful Question? Yes | No Thank you! Report Inappropriate This question has been reported. Thank you! HI! There is a HUGE variety of dies. Copy and paste this link into your search bar and you will see them! Customer service- [email protected] By: rsbc (17-Oct-18) Helpful Answer? Yes | No Thank you! Report Inappropriate This Answer has been reported. Thank you! 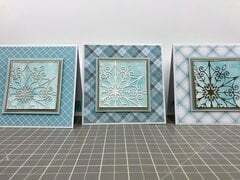 Can you use other brands of foils with the Spellbinders hot foil plates? By: Cathy Holman (01-Oct-18) Helpful Question? Yes | No Thank you! Report Inappropriate This question has been reported. Thank you! The heat activated foils that is used by the TODO machine are also compatible. I use both the Go Press & Foil AND the TODO foils for my projects. By: Frances01 (01-Nov-18) Helpful Answer? Yes | No Thank you! Report Inappropriate This Answer has been reported. Thank you! I believe as long as you use “heat activated” foils it should work. The Go Press and Foil machine has foils that should work. Other foil machines do not use the same heat activated method and you cannot put dies through them. These would include the Minc type machines. Their foils won’t work. There are some great videos on YouTube that demonstrates the differences. I hope this helps! By: micatty (03-Oct-18) Helpful Answer? Yes | No Thank you! Report Inappropriate This Answer has been reported. Thank you! I just got Platinum machine using the guide for the sandwich I can not get it to go though the machine. By: craftnjackie (07-Feb-19) Helpful Question? Yes | No Thank you! Report Inappropriate This question has been reported. Thank you! Hi Jackie. I haven't had any problem with my dies going through the machine. Use the base, then one of the base plates. Put your paper down and then your die on top. Place the other plate on top of that and then roll through. Sometimes you have to put a little muscle into it. It feels like it won't go through, but then it does. Try moving your die to the middle of the base and see if that helps. I get more resistance when the dies are bigger, but they still go through. I hope this helps! By: tmccoy723 (10-Feb-19) Helpful Answer? Yes | No Thank you! Report Inappropriate This Answer has been reported. Thank you!